The Holidays are a blessed time of love, care and affection. So, what better way to share that spirit than by gifting your loved ones unique presents that they can spend hours and hours playing with. Gifting is an absolute joy, but choosing the right gift can be tricky, especially with a 5 year old girl who is growing and developing quickly. With toys getting more exciting by the day and classic games from our childhood getting replaced by technologically driven counterparts, it is hard to find the best gift ideas for 5 year old girls. Here at doodleBuckets, we understand that. That’s why we set our team forward to scour the internet to compile the ultimate list of unique gift ideas for your girl so that you don’t have to. Sit back, relax, and enjoy. Be it your child, niece or grandchild, we’ve got a suggestion for everyone! 16.2 How to choose a toy for Your 5 Year Old Daughter? 16.3 What type of toys are included? 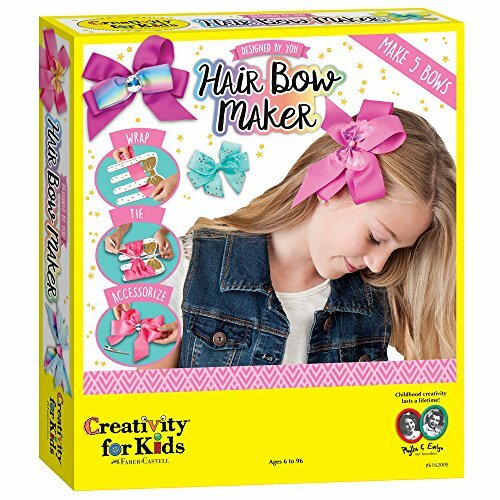 Let us introduce you to this amazing Fashion Hairband Craft Kit that your kid will absolutely fall in love with! It’s one of the most popular Christmas gifts for 5 year old girls. With a collection of ten multicolored hairbands complimented by rhinestones, flowers, feathers and more, you can let your child unleash her inner fashionista and craft beautiful accessories for herself and her friends. The kit includes a plethora of beads, stones and feathers to allow your kids to mix and match and create something unique to their taste. This is not only a great gift for your kid to play with and share with her friends, but also for her to cultivate creativity and self-dependence. This is an absolute blockbuster of a Christmas present. The kit has also been awarded the Mom’s Choice Award which shows that parents are loving how their kids can play with it. This kit is sure to keep your child engaged for a long time and encourages them to be creative while developing their DIY skills. This is a top present for children that are technology savvy. They have been made with recycled plastic and loaded with features such as electronic volume adjustment and a flashlight. So, your little girl has plenty to play around with. The walkie talkies are equipped with 22 channel two-way radios to avail long range coverage (up to 2 miles) for maximum enjoyment. They are a great toy for your child to bond with their friends and be more active outdoors. 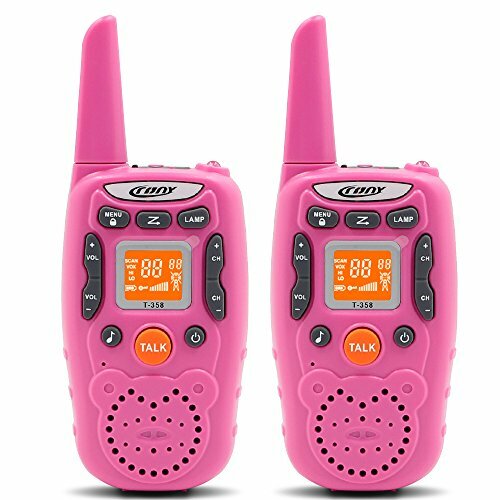 The vibrant pink design, effective 22 channel radio, and gorgeous LED panel make these walkie talkies a lot of fun for girls to use with their friends. This suggestion is a book that your child will love. 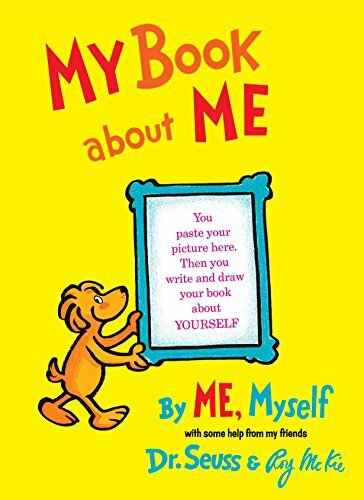 The timeless classic from Dr. Seuss is a perfect gift for your 5 year old to fill up sincere (and sometimes silly) details about themselves. Questions ranging from “Yes” and “No” to “Fill in the Blanks”, this book will put your child to the test in a way that is engaging and fun. 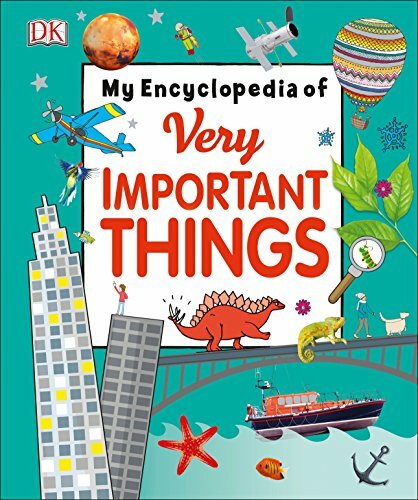 A simple idea with a surprising amount of educational value, this book is ideal for 5 year olds that will one day become a cherished memorabilia for parents. For years Dr. Seuss has found a way to engage with children in a manner that is unconventional and yet fun and engaging. Your child will love solving the quizzes, drawing things and creating stories that she wants to create. It is sure to promote creativity and a love for reading in your child. Children are inquisitive and while their little minds wrestle to understand how the world works, they can often offer unique perspectives. You can celebrate the scientist in your child by gifting them this wonderful book. The book is gripping and will demand your kid’s attention by means of its awesome graffiti and fluid storytelling. The book is aimed at children not only to learn about the world and the fauna we’re coexisting with, but also discover themselves in the process. It is a must have for kids growing up and we cannot recommend it enough. Some elements of the book might be a little difficult for a 5 year old to comprehend. Therefore, adult supervision may be required. This book is a fascinating collection of facts and history from around the world and is a must have for children of learning age for them to better understand our position in the world. The storytelling is engaging and is sure to contribute towards inculcating a love for books in your child. 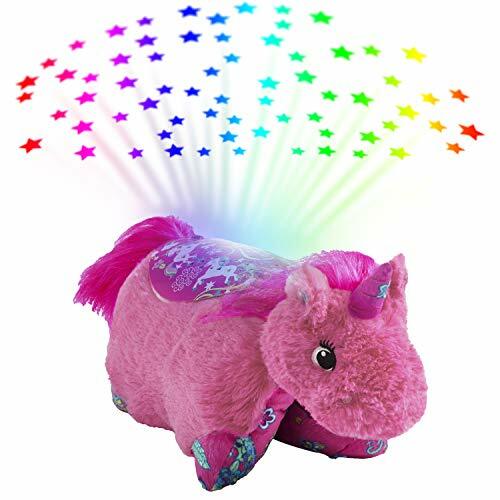 This adorable pink unicorn is a cool christmas present for 5 year old daughter. They have stuffed it with the highest quality chenille, to ensure this plush toy is going to be her next favorite! Its super soft, super comfy and while it is a cute animal by day, unfasten it and it becomes an incredibly comfortable pillow by night! It also comes with night lights that will illuminate your children’s rooms with bright stars if you choose so. The uncompromising quality of the toy coupled with innovative practicality makes it an ideal gift for any occasion. We absolutely recommend this! 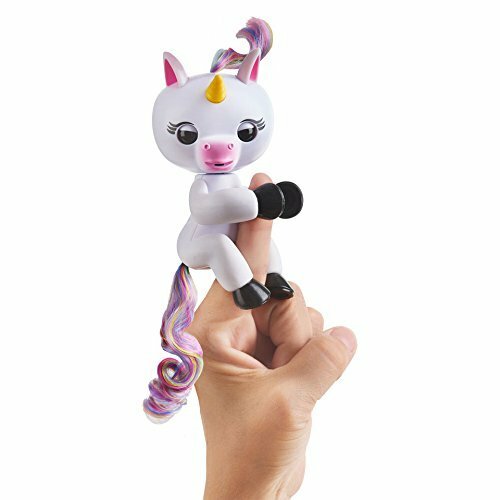 Say hello to this adorable baby unicorn who just wants to hold on to your fingers! Gigi is an interactive unicorn that responds to touch, noise, motion, and even head turns. Hold it in your hand and watch how it captures your attention by responding to your every action! This is going to be an absolute hit with kids irrespective of occasion. Let them pet Gigi to sleep or kiss her for her to kiss them back. We guarantee your child will have a ball with Gigi by her side. Gigi is a toy your kid won’t let go of. It is super interactive and super fun to engage with. If you want to gift your child something they would be gushing over for a long time to come, go for it. 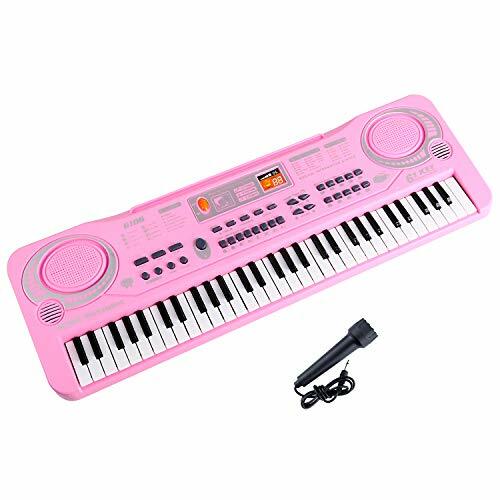 Cultivate the musical genius hidden inside your child by gifting her this beautiful 37 key portable keyboard piano. Made with high quality non-toxic plastic and loaded with features such as record and playback functions, this piano is all your kid needs to unleash her musical talents. Included with this piano is a microphone for your bundle of love to sing along to her favorite songs. Let them tinker around with the 100 rhythms and 5 demo songs to explore and create their very own musical compositions. Lightweight and easy to carry, this is a great gift for your child to unwind and learn music. The piano is a great way to introduce your kids to the world of music and they will love this gift. This makes a very special gift for any occasion. Recreate memories from your daughter’s favorite movie with this 94 piece Lego Disney Frozen Playground set. Introduce your child to the beautiful and creative world of Lego through this amazing set for her to create and experiment with the castle, slides, catapults and a rotating fountain. This Lego set is compatible to all other sets available in the market which enhances your child’s ability to mix and match to experiment with building structures. The set contains small pieces. So, caution is advised. 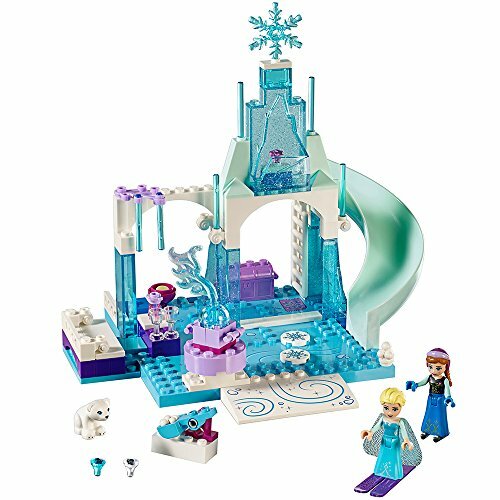 The beautiful Frozen themed Lego set is sure to grab the attention of your children and they would be spending countless hours with building and playing with the set afterward. 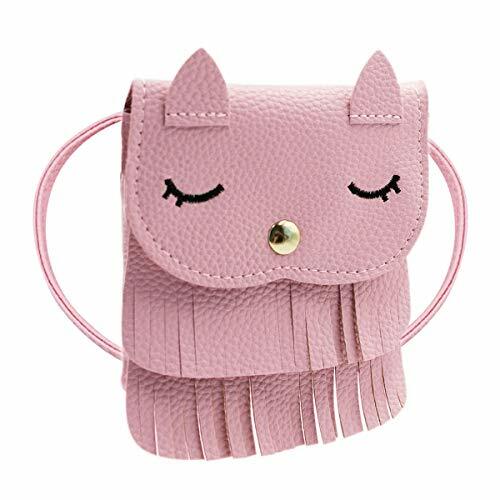 Let you child arrive in style with this trendy Tassel Shoulder Bag. Built with high quality soft leather for excellent durability, this bag is a statement in itself. The fun designs on the front lend a fun and vibrant image that goes perfectly with your little one. The bag has two relatively large compartments which makes it a useful accessory to have for your little one. Whether it be for carrying around essentials or candy! The latch is magnetic so that kids don’t have to worry about fastening the locks properly. The bag is made of high quality leather for assured longevity. This is a bag that turns heads! When your little one is going to be using it, all eyes will be on her. It is cute and practical. Harry is a Dalmatian who just wants to be friends. Powered by batteries, he barks, walks and follows you around the house. An incredible gift for your baby girl, this robot dog is the cutest thing ever. Touch his head and he dances for your amusement. 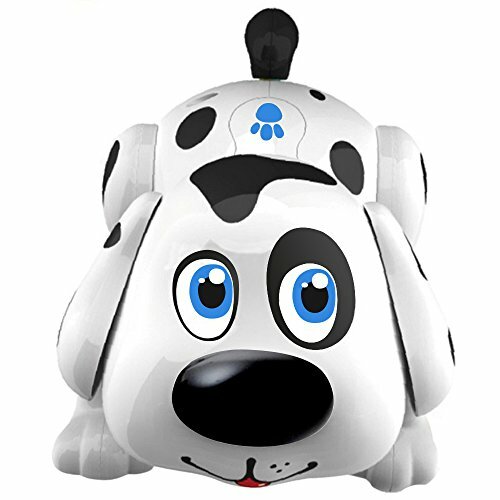 The robo dog comes fitted with hi-tech sensors that detect the slightest of movements and responds in a manner consistent with a real life dog. Harry is a brilliantly engineered robo pet that responds to touch and motion. Bring this home and rest assured your little darling will have a wonderful time! This classic is the ultimate celebration of individuality. 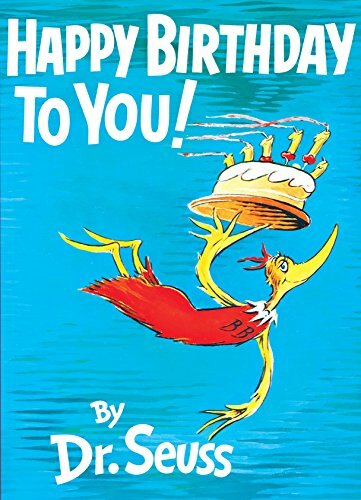 Published in 1959 by Dr. Seuss, this all-time best seller is an ode to the reader and forces one to recognize the beauty that lies within ourselves. The storyline of this book is especially interesting since it puts the reader as the protagonist. The mood of the story is festive and puts the reader in a joyous state of mind. A perfect book for kids, your little girl will love to own this. It is not only an excellent read, but also serves as an important tool in instilling within kids a sense of their own identities and self-love. The simple language, the effective message and beautiful storytelling has propelled this book to be a contemporary children’s classic. Buy this book and your little baby will have an amazing time reading and re-reading it over the years. 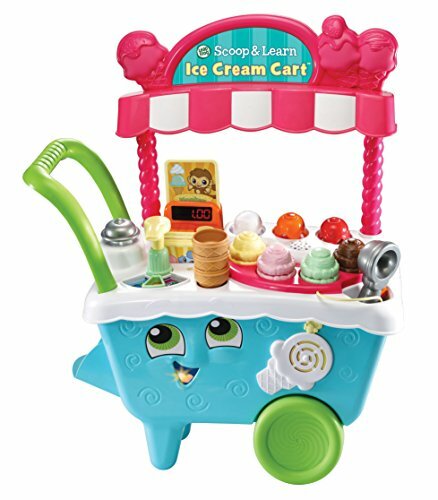 Kids love to roleplay which is even better when they can roleplay and learn, thus introducing the LeapFrog Scoop & Learn Ice Cream Cart. The ice cream cart is not only operational, but can also be used to hone your child’s memory and sequencing skills while mixing and matching from four different ice cream scoops and three toppings. It can also play songs for their amusement if they like so. The true value of this product far exceeds its listing description. It is an amazing tool for learning and improving your child’s skills while she enjoys roleplaying. The ultimate fashion accessory DIY set is here! Bring this home and watch your kid engulf herself in the mesmerizing world of DIY. 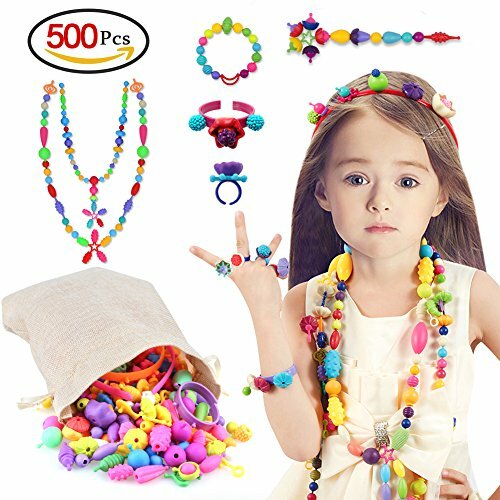 A pack of 500 pieces, this kit includes beads, rhinestones, hairbands and confetti to name a few and can be used to fashion anything from rings to bracelets to necklaces to tiaras. Christmas would be a whole lot happier with your baby girl owning this beautiful art set. The absolute massive set will be a treasure your little girl will cherish for a long time to come. This is a must-buy! When you’re a kid, trike rides are the coolest thing ever! 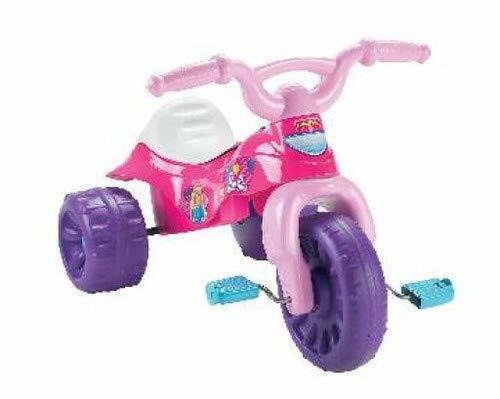 Now gift that joy to your little one by getting her this awesome Fisher-Price Barbie Tough Trike. Built with durable plastic and engineered to have a wide wheel base for maximum support, this is a trike she will enjoy will all her heart. The body of the trike is styled in the Barbie theme thus lending itself to a visually pleasing pink color with flowers all around. The trike can support a maximum weight of 55 lbs. The fine engineering and the excellent styling make this trike an ideal gift for the holidays. Little girls have a special connection with ponies, therefore, not including one in our list would be absolutely unthinkable. 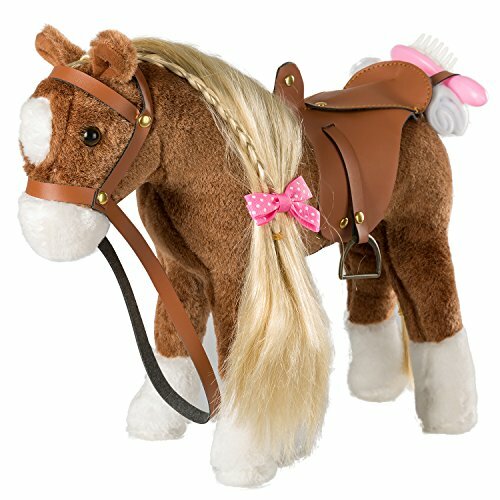 This plush stuffed pony comes with shimmering gold hair and a saddle made of leather. It is handcrafted to perfection and your little one is going to have an amazing time playing with it and dressing it up to her liking. This is a perfect gift for a birthday. The pony is handcrafted to a beautiful finish. The soft, plush feel of it is unmatched and it makes for an awesome gift for the holiday season as well as birthdays. Above we presented to you our best gift ideas for 5 year old girls. The toys included here are unique, fun and very popular Christmas gifts! Finding the ideal toy to gift your 5 year old girl can be quite a daunting task. With such a variety of options, it has become increasingly difficult to choose a gift that will be popular with kids and which they will enjoy playing with more than just a handful of times. We here at doodleBuckets have strived to compile the best collection of toys for your precious angel. Our research team digs deep to find the absolute best items available on the internet, be it gifting for Christmas, Easter or a birthday. If you are still struggling on what the top presents for 5 year old girls are, have a look at our tips in the shopping guide listed below. All toys included in the compiled list follow the Consumer Product Safety Guidelines mandated by the USA, EU and other major World governments. Furthermore, we stress on the build quality and the brand of the product to better judge if it would be safe for a 5 year old girl to play with. How to choose a toy for Your 5 Year Old Daughter? 5 year old girls are super active and going through learning phase so this is her time to soak up new information, learn about the workings of the world and understand interpersonal relationships. Therefore it is of prime importance that girls this age are given toys that are not only entertaining but also contribute to their learning process. The list above suggests fun toys for 5 year old girls that are fun, cool and unique. What type of toys are included? DIY kits are a great option for young kids, especially children in the 5 year age group. It is an amazing learning experience and teaches these young kids the basic laws of nature while cultivating in them an artistic inclination. Also, it is a great tool for improving their general motor skills and encourages them to experiment and think outside the box. Books are a friend for lifetime. Reading a book not only improves their vocabulary, it also helps build concentration and inculcate in them a habit of reading which is so valuable. As a 5 year old, your daughter can fully comprehend stories from the book that gets her invested and engaged for a long time. Technology has given us a lot of things and for the most part has been a boon. Driven by that spirit, we’ve compiled toys that are robo-pets that your 5 year old will have an amazing time playing with and getting to know. They respond to touch and motion and will blow your little angel’s mind! If you are looking for unique birthday gift ideas for 5 year old daughter, these are perfect for you. Girls love fashion, be it a teen or a 5 year old. From the latest to the greatest, we’ve compiled the list of fashion accessories that are must haves. Buy one of these and your little girl will spend hours experimenting with her new look! Your little girl is at the stage where she is learning through playing and we’ve created this ultimate comprehensive list of fun toys for 5 year old girls that are not only fun but also educational. Girls at this age develop their motor and social skills and gifting them toys that make them engage with other kids their age is a good idea. These social interactions can have major positive effects in adulthood. Choosing a toy keeping all this in mind might seem like a daunting task but we’re here for you. Our comprehensive list of top toys for little girls present to you options that not only will entertain kids for a long time but will also help with their physical, psychological and overall development.